I’ve been craving fruit a lot lately. Actually smoothies too, but fruit more. And most recently, it’s apples — which is great cos they’re in season. But not all apples are the same! I prefer apples to be super crisp, and sweet. Tart is ok, but sweet is better. So, in case you’re looking for a high quality apple, I have apple advice! I’ve eaten more apples this year than I have in the last like five. You know why they’re bad apples? Because they’re not crisp. They’re more… mealy? Like you can practically make applesauce just by biting into it. So if you don’t care for crispy apples, then no worries, Red and Golden Delicious might be perfectly lovely for you. But if your taste in apples is similar to mine, then the other ones will be better. That is all. Yum apples! That fruit bowl by the way, is fruit for two people for a week. Lately I have been obsessed by fruit so we buy a bunch every Saturday at the farmers’ market. 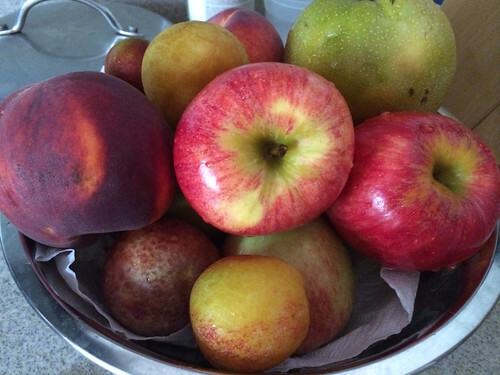 It used to be that we would buy like 6 fruit (say 2 pluots and 4 peaches or whatever) but now that would last 2-3 days and in fact, even that fruit bowl, we had to stop by the farmers’ market yesterday to supplement with two more apples. I have an apple problem. IT’S MADNESS, MADNESS I TELL YOU. Alas the recent apples were Golden Delicious and even though they were picked the day before, they weren’t crisp enough. Also, I don’t insist on buying fruit at the farmers’ market, although I suppose I do sort of prefer it, but in this case, we just happened to be going by one so we stopped. Geez you guys get a lot of varieties. I like Honeycrisps too. Fuji’s are too sweet. Pluots are really good.